There has been few common things happening all this year. 1. Bad news has been good news on the hope of easing and Good news has been great news. 2. Stock market has managed to move above 200 ma after all the sell off. 3. 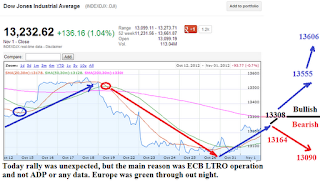 On every Sovereign downgrade, stock market have rallied. Last time stock market sold off on downgrade was August 2011 when S&P downgrade US for debt ceiling debacle. 4. There has been no changes in Greece, Spain, or Italy situation but stock market responded with hope that something will be done someday. When, and how only God knows. 5. US BLS and ADP have been real man working efficiently and every month their job data and jobless claim have been revised. 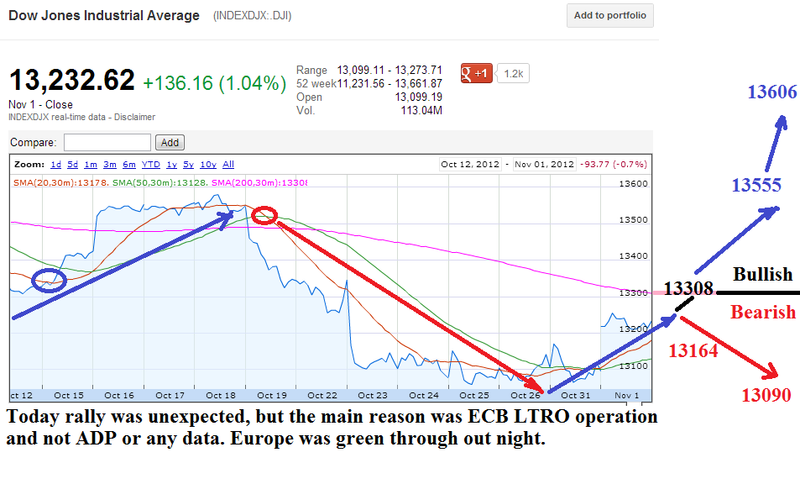 End result of this is S&P500 closed at 1427 and Dow jones closed at 13232. Tomorrow Non farm payroll is expected to show 125k job added, unemployment rate expected to tick up to 7.9%, Average hourly earning is expected to tick down to 0.2% Private pay roll to go higher to 120k. Its Obama last chance to show how great work has been done. Don't be surprise if unemployment rate falls to 7.6% and job goes up to 155k. 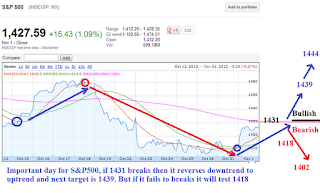 For bullish sentiment to continue, Dow jones need to break 13272 and S&P500 need to break 1431. 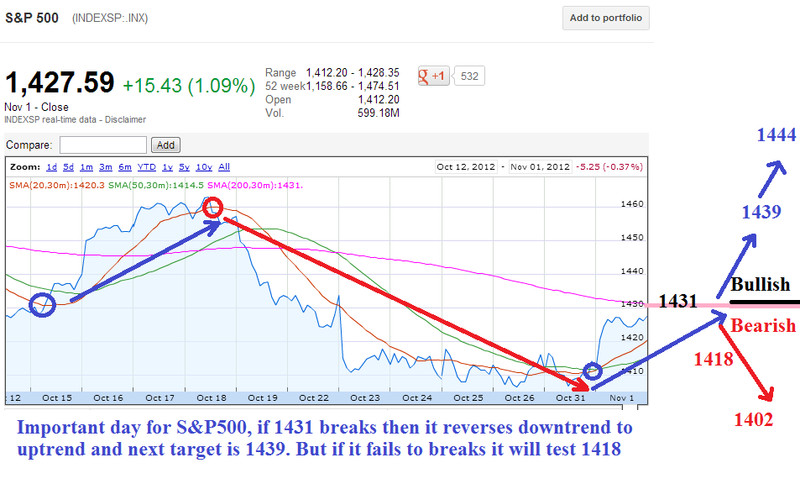 For bearish sentiment to continue, Dow jones need to break 13186 and S&P500 need to break 1424. Dow jones now at critical level. 13308 will confirm long term bullish trend. Chevron Corporation ( CVX ) is reporting for the quarter ending September 30, 2012. The oil company's consensus earnings per share forecast from the 14 analysts that follow the stock is $2.85. This value represents a -27.30% decrease compared to the same quarter last year. Thomson Reuters Corp ( TRI ) is reporting for the quarter ending September 30, 2012. The technology services company's consensus earnings per share forecast from the 15 analysts that follow the stock is $0.47. This value represents a -16.07% decrease compared to the same quarter last year. TRI missed the consensus earnings per share in the 4th calendar quarter by -1.82%. The "days to cover" for this stock exceeds 26 days. Valeant Pharmaceuticals International, Inc. ( VRX ) is reporting for the quarter ending September 30, 2012. The drug company's consensus earnings per share forecast from the 2 analysts that follow the stock is $1.09. This value represents a 75.81% increase compared to the same quarter last year. In the past year VRX has beat the expectations every quarter. The highest one was in the 2nd calendar quarter where they beat the consensus by 1%. McGraw-Hill Companies, Inc. ( MHP ) is reporting for the quarter ending September 30, 2012. The book publisher company's consensus earnings per share forecast from the 6 analysts that follow the stock is $1.30. This value represents a 7.44% increase compared to the same quarter last year. MHP missed the consensus earnings per share in the 3rd calendar quarter by -1.63%. Clorox Company ( CLX ) is reporting for the quarter ending September 30, 2012. The cleaning company's consensus earnings per share forecast from the 13 analysts that follow the stock is $0.95. This value represents a -5.94% decrease compared to the same quarter last year. In the past year CLX has beat the expectations every quarter. The highest one was in the 3rd calendar quarter where they beat the consensus by 6.32%. Ralph Lauren Corporation ( RL ) is reporting for the quarter ending September 30, 2012. The textile company's consensus earnings per share forecast from the 12 analysts that follow the stock is $2.15. This value represents a -12.60% decrease compared to the same quarter last year. In the past year RL has beat the expectations every quarter. The highest one was in the 2nd calendar quarter where they beat the consensus by 14.04%. Beam Inc. ( BEAM ) is reporting for the quarter ending September 30, 2012. The alcohol company's consensus earnings per share forecast from the 8 analysts that follow the stock is $0.55. This value represents a 3.77% increase compared to the same quarter last year. BEAM missed the consensus earnings per share in the 3rd calendar quarter by -10.17%. NiSource, Inc ( NI ) is reporting for the quarter ending September 30, 2012. The electric power utilities company's consensus earnings per share forecast from the 4 analysts that follow the stock is $0.05. This value represents a -54.55% decrease compared to the same quarter last year. NI missed the consensus earnings per share in the 4th calendar quarter by -13.89%. Pinnacle West Capital Corporation ( PNW ) is reporting for the quarter ending September 30, 2012. The electric power utilities company's consensus earnings per share forecast from the 9 analysts that follow the stock is $2.23. This value represents a -0.45% decrease compared to the same quarter last year. In the past year PNW has met analyst expectations once and beat the expectations the other three quarters. Cimarex Energy Co ( XEC ) is reporting for the quarter ending September 30, 2012. The oil (us exp & production) company's consensus earnings per share forecast from the 16 analysts that follow the stock is $0.94. This value represents a -35.17% decrease compared to the same quarter last year.